No points (nul points) to the technical team behind the event, whose fingers seemed to keep slipping onto the wrong buttons and causing all kinds of chaos. Unless, of course, they were simply trying to recreate the confused feel of a normal Eurovision night, in which case they should be applauded. One point (un point) to the night’s opener Des O’Connor (Greenland) who didn’t as much sing as mime his act – but then again he was wearing the oversized head of a bear whilst dressed in a white suit, which made anything more than growling pretty difficult. Two points (deux points) to Rayguns Look Real Enough (Germany), whose choice of costume (man in tiger onesie with a cut out belly filled by a gyrating round stomach and man in emo getup) hasn’t changed a great deal since they first tried their luck at winning the continent’s finest prize. Neither, it seems, has their patter – which came off sounding a little too rehearsed, even if their mashup medley of pop songs did get the crowd’s toes tapping. Three points (trois points) to Ivy Paige (UK). Inevitably the island nation failed to live up to its once commendable record by putting out a far too ponderous ballad, being rather too pleased with itself, and declining to do any skirt ripping whatsoever. Four points (quatre points) to the evening’s host Anna Greenwood. Even though she occasionally seemed to be losing the plot and forget which act was coming next, her brave and bizarre costume changes in-between acts were truly in the spirit of Eurovision. However we do hope she’s kept the receipt on many of her questionable choices for the evening. Five points (cinq points) for one of the night’s joint winners Vikki Stone (Ireland). The luck of the Irish was certainly on Stone’s side this evening – who’d have thought performing sexual acts on a bassoon would have netted her first place? Clearly this stand-up comedian had done her homework, taking a leaf from last year’s X-rated Polish entry. Six points (six points) to proud Penge resident Carly Smallman (Spain) who by her own admission had been booked to appear at the last minute and had no affinity with Spain whatsoever, apart from once having eaten tapas. Nevertheless her self-penned love song – to herself – with intercuts of Bon Jovi’s Living On A Prayer (the idea being that Bon Jovi are likely to play Spain again…sometime in the next decade) was a pleasing upbeat addition to this year’s programme. Seven points (sept points) to the ever cool Marcel Lucont (France), the other joint winner of the evening. With his suit, bare feet and plastic cup of red wine he brought a rare moment of class to proceedings, even if he did then spoil it all by singing a tribute to Nigel Farage and UKIP in the style of Abba’s Thank You For The Music. Eight points (huit points) to Ria Lina (Romania) and her backing dancers of two burly bandana’d men and a tiny ballerina, who was swiftly abused as being “pale” and “too white” by our Romanian singer. Nigel Farage got another controversial mention – making him the Alternative Eurovision equivalent of Conchita Wurst. Ten points (dix points) to Tricity Vogue representing everyone’s favourite Eurovision contestant, the British Lunar Colony. Having beamed over to us from the year 2065, “94” year old Tricity shambled on stage with the help of some nifty wheeled trainers to tell us about the good ol’ days – by singing Video Killed The Radio Star on a ukulele. It was a song that had everyone in good spirits, even though we were all far too young to understand what any of it meant. Twelve points (douze points) go to faux female American country singer Tina C (Australia) whose confused knowledge of her chosen country (“Australasia”), her song (Waltzing Matilda – with improvised rapping), and just about everything to do with the Eurovision led to much hilarity, even if it was at the bemused entertainer’s expense. Honourable mentions go to the night’s interval act Aurora Galore (above), who entranced us with an amazing fire show in between all the tomfoolery. 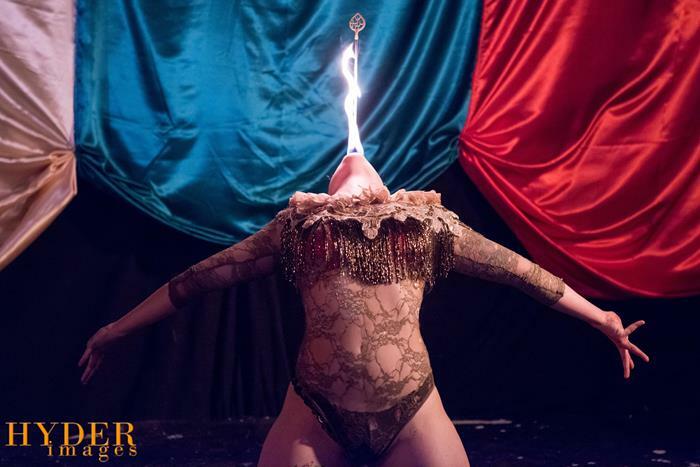 There’s plenty more at London Wonderground this year. Gorge yourself on our exclusive roundup.